The Royal Sovereign RSH-1651 is a high quality, fast 65" wide format roll laminator that is designed to allow large format inkjet output to be laminated with superior quality. The RSH-1651 uses a high quality microprocessor that provides stable temperature control for the rollers during the laminating process. It also allows users to adjust the temperature on the fly. Using the RSH-1651 it is possible to quickly and easily laminate, encapsulate, mount or finish your documents, images, prints, posters and banners. In fact this feature rich machine can handle a huge variety of applications making it an excellent choice for in plant printers, copy shops, print shops and print for pay facilities. Plus, the RSH-1651 offers auto grip hubs for easy roll changes and faster laminating speeds than the smaller RSH-1050 41" Wide Format Roll Laminator or the RSH-1650 65" Wide Format Roll Laminator. Fast - Laminates pressure sensitive and thermal film up to 65" wide at a rate of 9.8' per minute. Quality - Digital controls for temperature and speed help deliver a perfect finish. Versatility - Designed for mounting, laminating & encapsulating individual of multiple copies of posters prints, POP signs, training aids, rigid or flexible signage floor graphics, trade show displays and much more. Convenient - Nine job memory setting feature for frequently used settings. Auto-grip film shafts for easy material handling. High quality silicone rubber rollers for both thermal or cold lamination applications. Transcript: This is the Royal Sovereign RSH-1151 and the RSH-1651 Roll laminator! First I’m going to go over some of the features, of the two machines. The only real difference between the two is the size—which is 45 inches and 65 inches. You can adjust the rollers to use mounting boards up to 5/8” thick. There are emergency stops on both the front and the back of the machine. Twist the knob to continue laminating again. There are three different ways to start, stop, and reverse the laminator—a mouse pad attached to the back, the main panel, and a foot petal. This is the Royal Sovereign RSH-1151 and the RSH-1651 Roll laminator! On the front panel you can change the individual temperatures of each roller separately, switch it from hot or cold laminating, save different variations in your settings, and turn on the back fan to help prevent your project from becoming wavy/bowing. On the back, there is also a straight blade trimmer to remove the projects from the laminator. Okay, now for the setup! Turn the rollers on so they begin heating up to the appropriate temperature. I’ll start in the back—if you have a roll already on that needs replaced, remove it from the laminator—be sure to cut the lamination first. Now slip the roll off the bar…and insert the bar into your new roll. Place the bar into the left side first, then insert it into position on the right. The outside of the film should drape over the machine as seen here—if it is shiny—then shiny side out. Do the same thing for the bottom roll—again, shiny side facing away from the machine when draped. This is important when inserting it into the rollers. Now lift the roll cover and remove the extra hand guard. Lift up and pull out the table piece. On the bottom roller, pull the film out about two feet, then feed it under the bottom bar—located directly under the bottom heat roller. Pull it up and over the bar careful as to not touch the heating rollers. On the back, pull about two feet of film, and bring it OVER the metal bar and rest it on top of the heat rollers. At this point you can see that my two rolls do not align. To help with this the bars have lines on them so you can place the rolls in the same position—you can also measure out the distance on each so they match. Now drape the bottom film over the top so they stick together—you can see that my rolls are still not aligned perfectly, to which I can still adjust later if needed. Place the table back on, and the hand guard. Then lower the safety shield. To feed the film through, adjust the opening for the correct size of any scrap board you have. Then push the board into the rollers while they are on until they grab the board and feed it through. Make sure you use a thick board like foam core! The one I used here was not thick enough and it missed the back rollers, then I had to grab and pull it through—and it was not fun. Let the lamination run a bit to get al the wrinkles out. Now I can adjust the edge guides on my table and start laminating some pretty big projects. And go around back, wait for it to finish, then cut it off to trim up nicely with another trimmer. As a last note, make sure to turn the rollers on, before you insert your project—otherwise you might end up with extra creases closer to the edge than you want. If your projects are wrinkled, wavy, or you rollers won’t start, here are a few troubleshooting tips. Also, our customer service is always ready to walk you through steps to figure out any problems! Are you in the market for a wide-format roll laminator? If so, you should take a look at Royal Sovereign's RSH-1651. Here is what's great - and not so great - about this product. The RSH-1651 has a phenomenal laminating width. It's capable of processing items that are up to 65 inches wide - that's more than 5 feet across. It's the perfect laminator to use for those big projects such as posters, point-of-purchase displays, and more. This device is compatible with laminating film of many different thicknesses. It can process film that's 1 mil or 10 mil thick. This will enable you to use a variety of film and you'll be able to select just the right thickness for your project. The rolls of film this machine can handle must have 2.25" or 3" cores. If you want, you can also take advantage of mounting boards because this device can process ones that are up to 5/8" thick. The RSH-1651 offers both hot and cold lamination settings so you can use thermal and pressure-sensitive film with it. The hottest temperature it can reach is 320 degrees Fahrenheit which is about 160 degrees Celsius. This machine will shut off automatically after it hasn't been used for a while. Not only will this keep the motor in good shape, it drastically reduces the risk of a fire - and a high electric bill. Everything that passes through this device will look great. That's because this machine has four rollers to ensure that everything will be wrinkle- and bubble-free. The rollers will stay in good shape because there are 3 blowers to help them cool off. Operation is actually pretty easy because this device has a foot pedal. This will allow you to keep your hands free. The RSH-1651 comes with two warranties. As a whole, it's covered for an entire year. However, the rollers are covered for just 6 months. 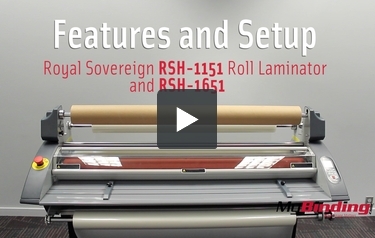 Any machine with a 65-inch laminating width has got to be huge and that's exactly the case with the RSH-1651. Its dimensions are 77" (width) x 25.5" (depth) x 47.5" (height), which is very large indeed. Plus, it weighs almost half a ton, so moving it from place to place will be challenging to say the least. Since this laminator is so large, it takes a very long time to warm up. It will take a full 40 minutes before you can use it, which is a really long time. You'll want to warm it up well ahead of time so it will be ready when you are. However, once it's ready, it can laminate almost 10 feet of material in 60 seconds. When it comes right down to it, the Royal Sovereign RSH-1651 is a really remarkable roll laminator. It has just about everything you could ever want in such a device, such as the ability to process both thermal and pressure-sensitive film (and mounting boards! ), the automatic shut-off feature, and its remarkably easy operation. So long as its size and long warm-up time don't bother you, the RSH-1651 is one machine that's worth your consideration.